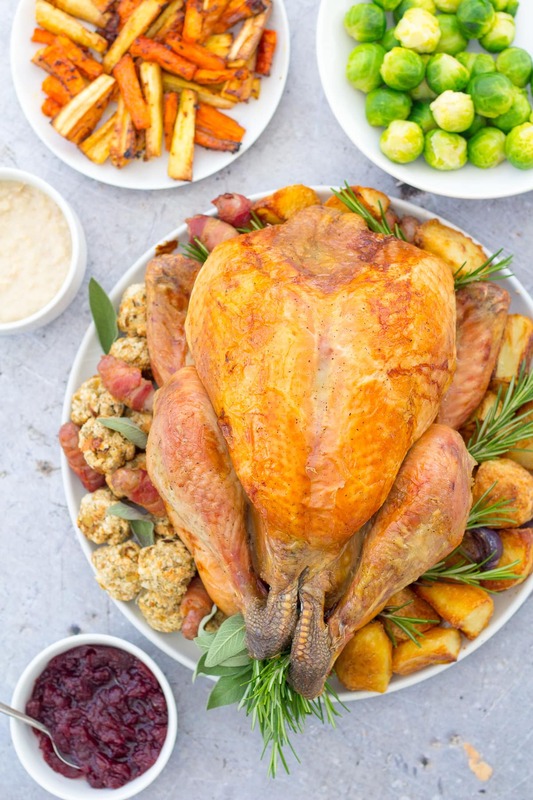 Home » All Recipes » Christmas » How to cook perfect roast turkey – the stress-free way! Take all the stress out of Christmas dinner by cooking my foolproof whole roast turkey recipe. Deliciously juicy breast meat, crispy skin and absolutely no faff! 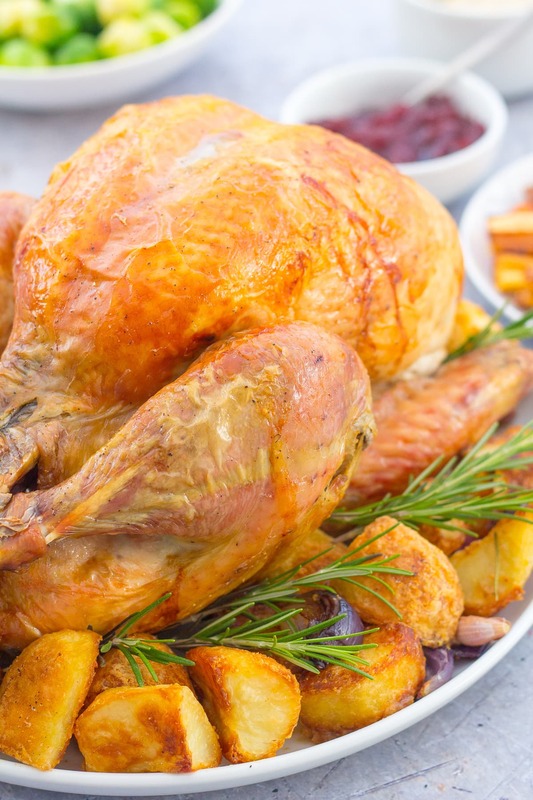 Read on to discover how to cook perfect roast turkey – the stress-free way! For many of us Christmas wouldn’t be Christmas without an impressive whole roast turkey taking centre stage on the Christmas lunch table. But all too often, cooking that big ol’ turkey can cause much stress and frustration. It’s a meat most people only cook at Christmas and it’s often being cooked for guests too – only adding to the stress and desire to get it ‘just right’. To help you cook that perfect roast turkey this year WITHOUT the stress, I’m sharing my perfect roast turkey recipe. Delicious juicy breast meat, crispy skin and absolutely no faff! For more stress free Christmas recipes head over to my Easy Christmas Dinner Recipes for a fabulous collection of easy Christmas starters, mains, sides, sauces, vegetarian dishes and puddings. Why is this turkey recipe so stress free? A few reasons, first I have kept things really, really simple – no brining, no stuffing (I always cook my stuffing separately), no butter under the skin, no cooking upside-down, no other fancy cheffy techniques. Second, keeping things really simple means very little hands on time – this turkey needs LESS THAN 10 MINUTES hands on time!! Third, I’ve made sure this perfect roast turkey recipe really works with the rest of the Christmas lunch – too often recipes for roast turkey are given with no thought for what else is cooking – especially the fact that roast potatoes need a really hot oven to crisp up properly. This recipe is timed so the roast potatoes can go into the oven at the same time as the oven gets turned up (for the last 30 minutes of turkey cooking time) and continue cooking while the turkey rests. 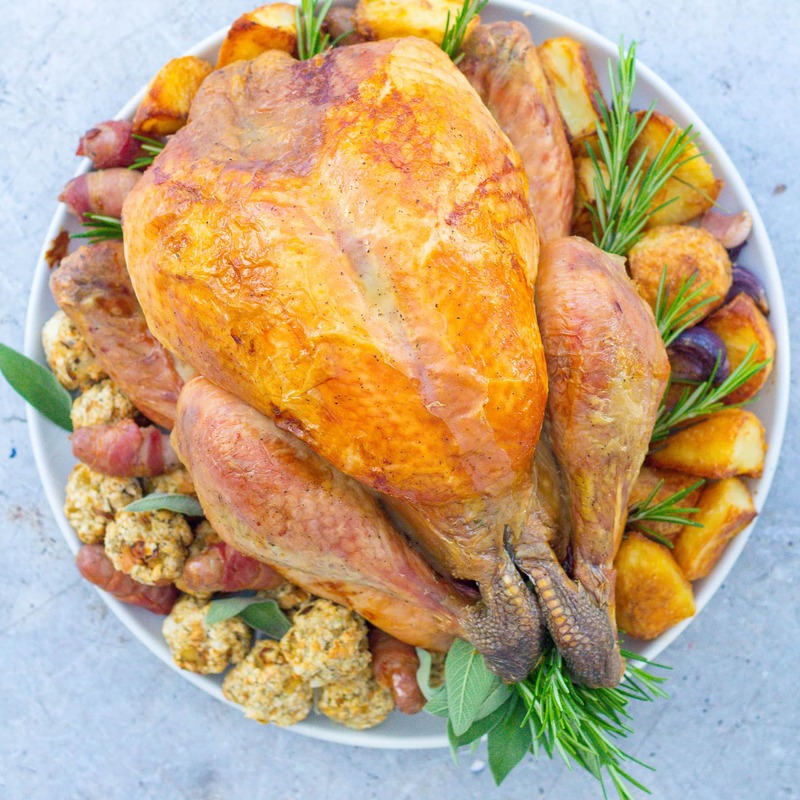 But just because this recipe is simple, doesn’t mean I’ve stinted on flavour – the recipe below is designed to yield juicy tender meat and crisp turkey skin and it really lets the flavour of the turkey shine! This ensures the turkey is at room temperature before you start cooking – meaning that early part of cooking won’t be dedicated to bringing the temperature up from fridge temperature. This results in a shorter cooking time and a juicier, more succulent turkey. If you stuff your turkey, you have to cook it for a lot longer to ensure the stuffing is piping hot all the way through (and to ensure you are not at risk of food poisoning). This means the turkey is in the oven much longer, resulting in dried out breast meat! This ensures the skin doesn’t burn before the turkey is cooked and also keeps the juices in! This allows heat of the oven circulate underneath the turkey, ensuring the turkey cooks evenly (no burnt overcooked bits on the bottom). It also ensures the turkey skin stays crisp all over. This is another fab tip to keep the breast meat moist. During the first part of cooking the turkey is almost steamed as there is all that water plus the turkey is encased in foil helping to keep all that moisture in. To get really crispy skin! 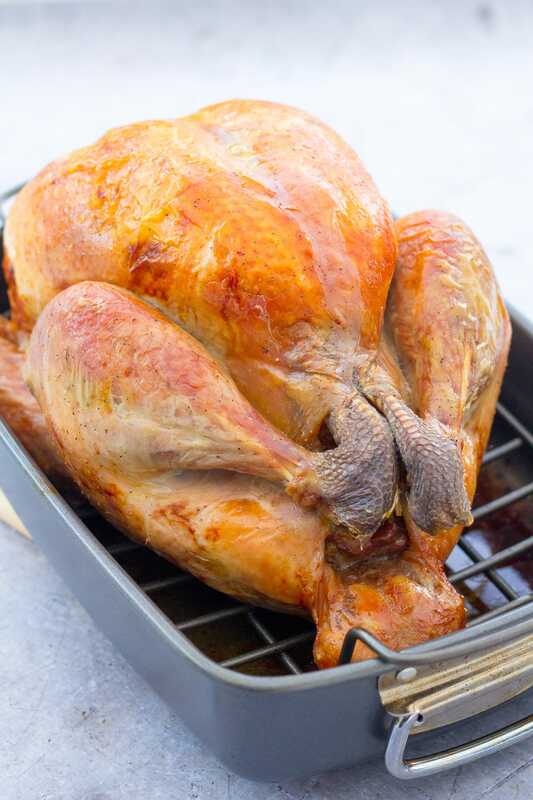 I cook my turkey at 180C (160 fan / gas mark 4 / 350F) for the majority of cooking time, but then whack the oven temp up to 220C (200C fan / gas mark 7 / 425F) for the last 30 minutes – this gives really crispy skin, but isn’t long enough for the turkey to dry out. It also means the oven is the perfect temperature for getting properly crispy roast potatoes! Most recipes suggest you rest the turkey for an hour covered in foil and tea towels. Not only is this a whole load of extra faff right when your time could be better spent elsewhere, but it also means that carefully crisped up skin won’t be crispy anymore! I’ve experimented a bit and I think half an hour is plenty to allow the meat to become tender. After 30 minutes the turkey is still very warm, even if left totally uncovered (especially if it’s in a hot kitchen – which, let’s face it, is pretty normal on Christmas day!). How long should you cook a whole turkey in the oven for? This obviously depends on your turkey size. But as a guide, roast your turkey at 180C / 160C fan / gas mark 4 /350F for 20 mins per kg plus 90 mins, turning your oven up to 220C / 200C fan / gas mark 7 / 425F for the last 30 minutes. How much turkey do you need per person? Now this really does depend on appetite! But based on medium adult appetites, you should allow 500g per person for a whole turkey, 325g per person for a turkey crown and 250g per person for a turkey breast joint (all based on uncooked turkey weight including bones etc.). Do remember kids are likely to only eat a very small amount and older relatives often have smaller appetites too. How long to defrost a turkey for? This is really important and something people often underestimate! 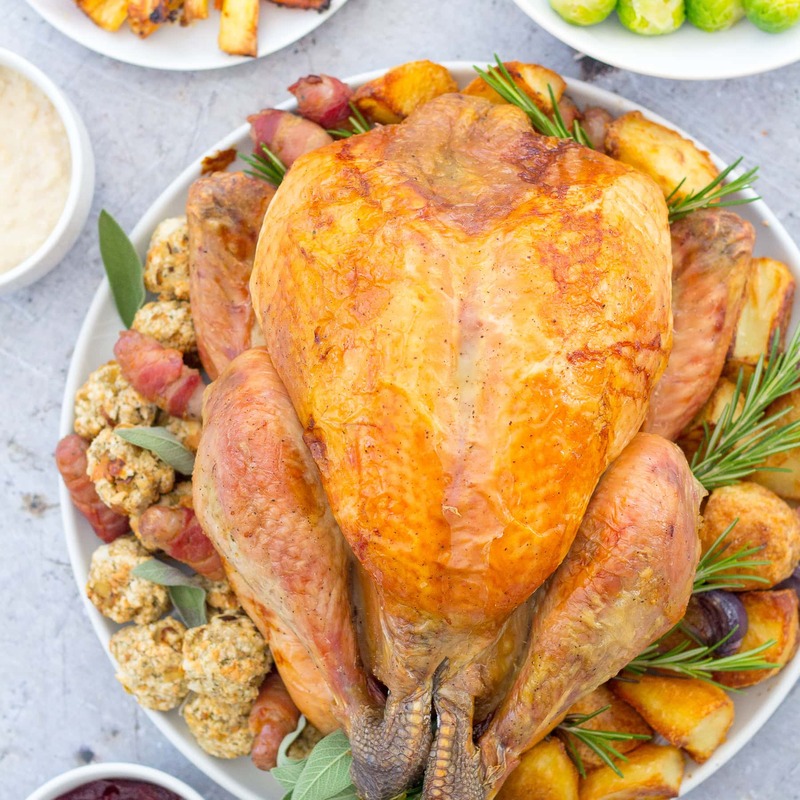 Even a small turkey (3kg) will take about 48 hours to defrost in the fridge and a large one (7kg) could take up to 112 hours – that’s over 4 days! Do be very careful if you choose to defrost your turkey in a cold room – don’t leave it out too long and do bear in mind that the warmer the temperature you defrost at, the greater your risk of food poisoning. Definitely make sure you get the turkey straight into the fridge once it has defrosted. My personal preference is to defrost in the fridge, which is much safer. 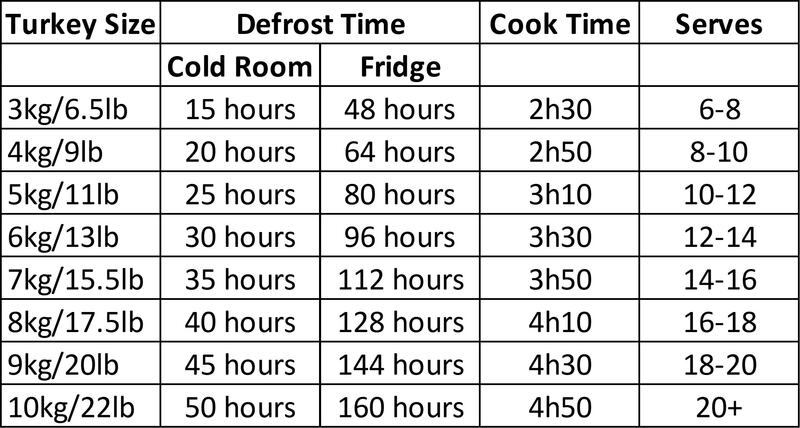 Quick reference guide – defrosting times, cooking times and quantities for whole roast turkey. Cooking time based on cooking at 180C / Fan 160C / Gas 4 / 350F for the majority of cooking time, turning your oven up to 220C / 200C fan / gas mark 7 / 425F for the last 30 minutes. Please note this table gives defrosting times, cooking times and quantities for WHOLE TURKEYS – crowns and breast joints are different. 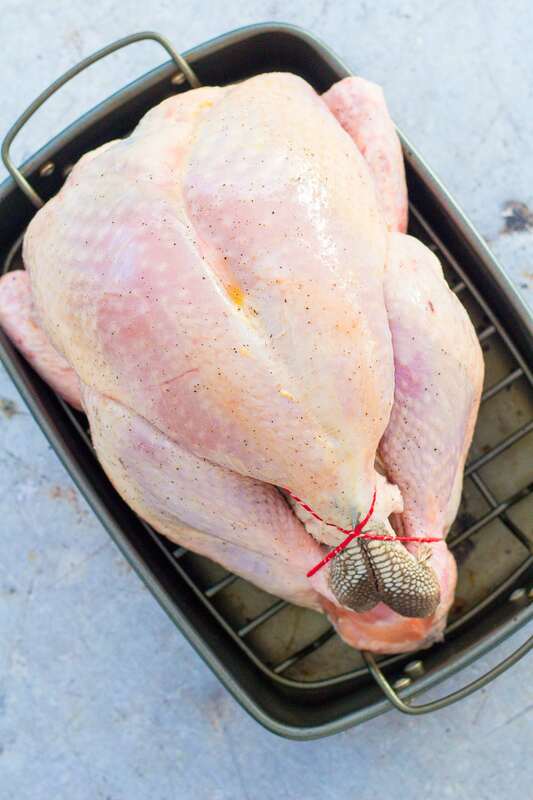 Check out my recipe for Easy Roast Turkey Crown for defrosting times, cooking times and quantities for turkey crowns and breast joints. How long can you keep turkey leftovers in the fridge? Turkey leftovers can be kept in the fridge for 3-4 days. However, it is really important you get the leftovers into the fridge within 2 hours of being cooked to avoid food poisoning. If you choose to reheat leftovers, ensure you do this until they are piping hot! Wondering what to do with your turkey leftovers? Check out my easy ideas for your turkey leftovers! Can you freeze roast turkey leftovers? Absolutely! Turkey leftovers can be frozen very successfully. Having a stash of leftover turkey in your fridge ensures cheap, healthy and delicious meals throughout January. 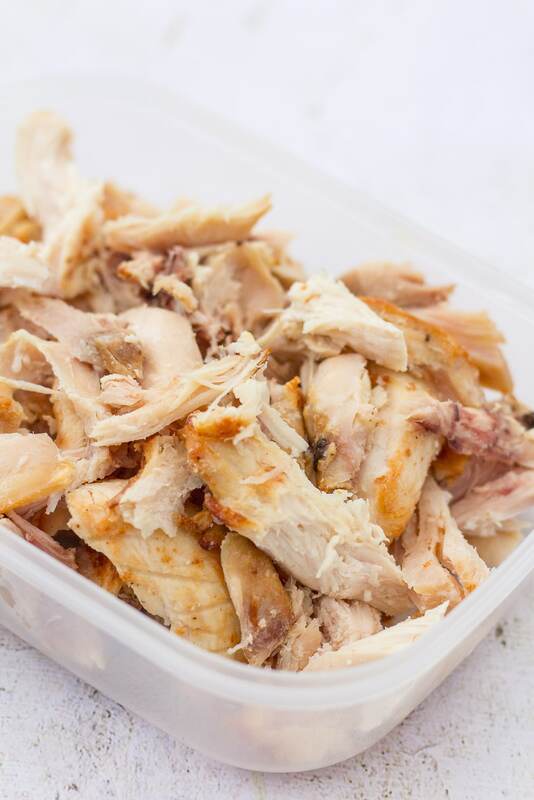 To freeze turkey leftovers, divide up the meat into meal sized portions and put into freezer proof boxes and freeze. I like to divide up my leftovers into 400g portions – this is just perfect for a meal for a family of 4. It’s really important you get your turkey leftovers into the fridge or freezer within 2 hours of being cooked to avoid food poisoning. If you’ve got them into the fridge straight away, but plan on freezing your leftovers, make sure you transfer the leftovers from the fridge to the freezer ASAP – certainly within a day or so of refrigerating them. 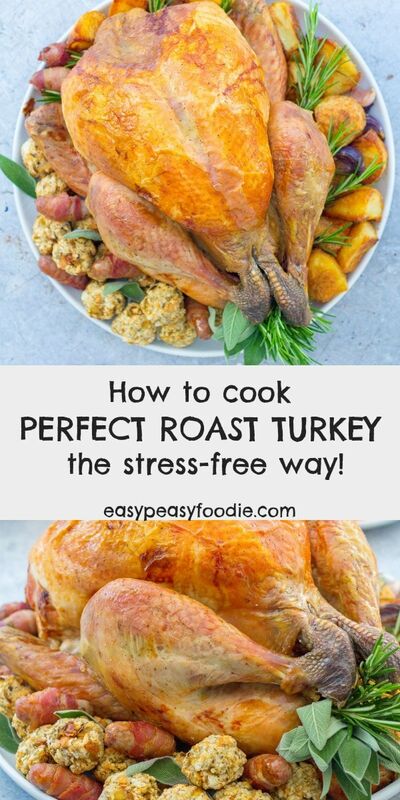 Perfect Roast Turkey - the stress free way! Take all the stress out of Christmas dinner by cooking my foolproof roast turkey recipe. Deliciously juicy breast meat, crispy skin and absolutely no faff! 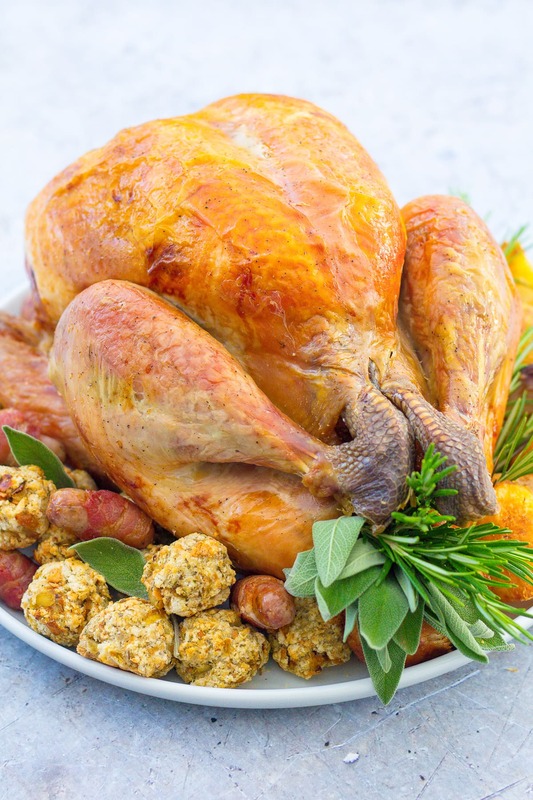 Read on to discover how to roast the perfect turkey – the stress-free way!! Remove your turkey from the fridge about an hour before you are going to cook it. Preheat your oven to 180C / 160C fan/ gas mark 4 / 350F about 15 minutes before you want to start cooking your turkey. It is really important that your oven is at the right temperature before you start. Next, drizzle 2 tablespoons of olive oil over the turkey and add a pinch of salt and a good few twists of black pepper. Rub the oil, salt and pepper all over the bird and place, breast side up on a rack in a roasting tray. Pour 250ml cold water into the base of the roasting tray. Calculate the roasting time based on 20 mins per kg plus 90 mins. See notes for precise cooking times. This is the TOTAL TIME the turkey will be in the oven for. Cover the turkey in foil and roast for 1 hour LESS than the total time you have calculated. The foil will help keep the breast meat juicy and stop the skin browning too soon and burning before the meat is cooked. Wen there is 1 hour remaining of the TOTAL TIME, remove the turkey from the oven and remove the foil. Baste the turkey with the juices you find at the bottom of the tin. Put the turkey back in the oven, uncovered this time, for a further 30 minutes. After this 30 minutes, turn the oven up to 220C / 200C fan / gas mark 7 / 425F, remove the turkey from the oven and baste with the juices. Return the turkey back to the oven for a final 30 minutes. Cooking the turkey at a higher temperature will help the turkey skin to brown and crisp up. This is also the perfect temperature for roast potatoes, meaning you can start them now and they will be ready when the turkey has rested for 30 minutes. After a final 30 minutes (the turkey will now have cooked for the TOTAL TIME you calculated in step 3), remove the turkey from the oven and check it is done. Stick a small sharp knife in the fattest part of the turkey (between the breast and the thigh), and the juices should run clear and the meat should be white. If you have a meat thermometer, the internal temperature should be 74C (165F). 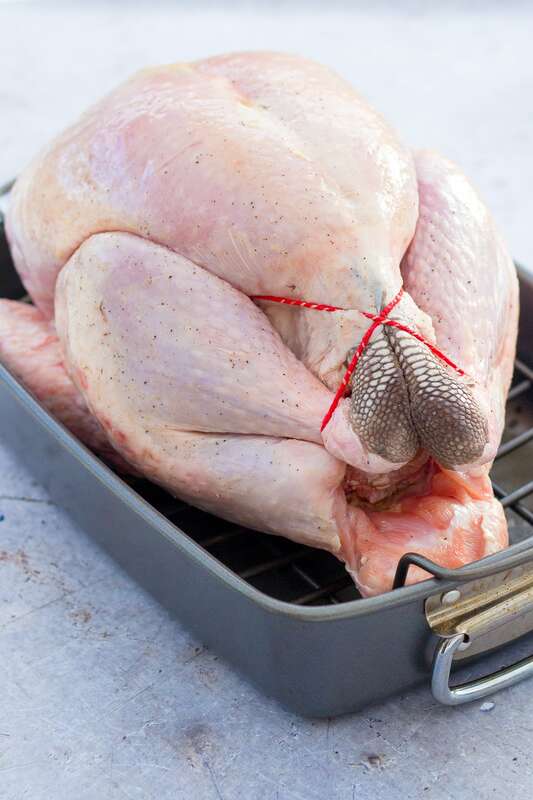 Transfer the turkey to a clean roasting tin (or similar). Allow the turkey to rest for 30 minutes, uncovered. It will not get cold and the meat will taste much better for being rested. Not covering the turkey also ensures the turkey will not lose its crispy skin. Use the turkey roasting tray to make delicious turkey gravy. Total cooking times: 3kg/6.5lb turkey = 2h30, 4kg/9lb turkey = 2h50, 5kg/11lb turkey = 3h10, 6kg/13lb turkey = 3h30, 7kg/15.5lb turkey = 3h50, 8kg/17.5lb turkey = 4h10, 9kg/20lb turkey = 4h30, 10kg/22lb turkey = 4h50. This is a great guide, Eb, particularly with how you have it timed for the sides and pulling the whole meal together. Early on, the timing of the turkey and all the side dishes was one thing I struggled with. what a supper helpful recipe and post. Anything that helps take the stress out of Christmas day is good by me. I think the most important thing though has not to over stress, who cares if dinner runs a bit late or you forget the 2nd stuffing you had in the fridge. Christmas is all about being with you family and or friends and enjoying yourself.